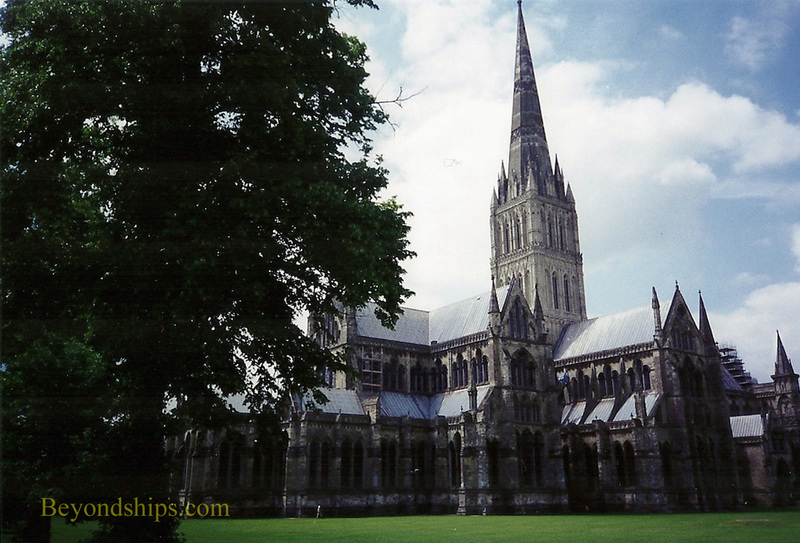 With its delicate spire soaring over the city, Salisbury Cathedral is a magnificent sight. Indeed, it has long been an inspiration for artists. Situated in the Cathedral Close, it is an oasis of peace away from yet in the center of the busy town. Salisbury Cathedral was built to replace the cathedral at Old Sarum. The foundation stone was laid in 1220 and the main part of the church was finished in 1258. Because it was built so quickly, the building is all of one architectural style - - Early English Gothic. The cathedral's signature tower and spire were added between 1300 and 1320. 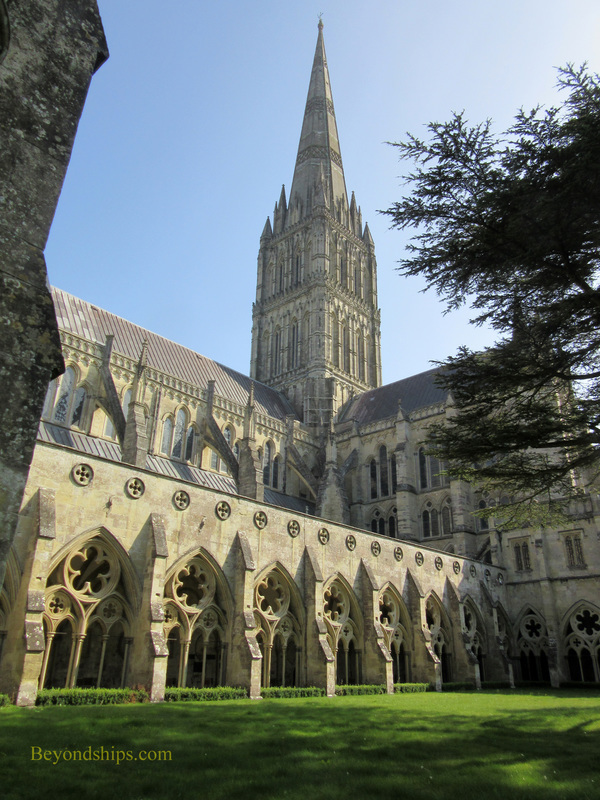 Salisbury's is the tallest spire in England reaching 404 feet (123 m) into the sky. Weighing 6,500 tons, the spire put considerable strain on the structure. Therefore, over the centuries additional buttresses and reinforcement was added to the building. In the 17th century, England's leading architect Sir Christopher Wren added a series of beams to maintain the structural integrity. In the late 18th century James Wyatt remodeled the cathedral, doing away with several of its medieval elements. Some of these were reversed by Gilbert Scott in the mid-19th century. However, in the 1960s, some of Scott's Victorian Gothic touches were removed. Salisbury Cathedral has inspired many artists most notable the English landscape painter John Constable. 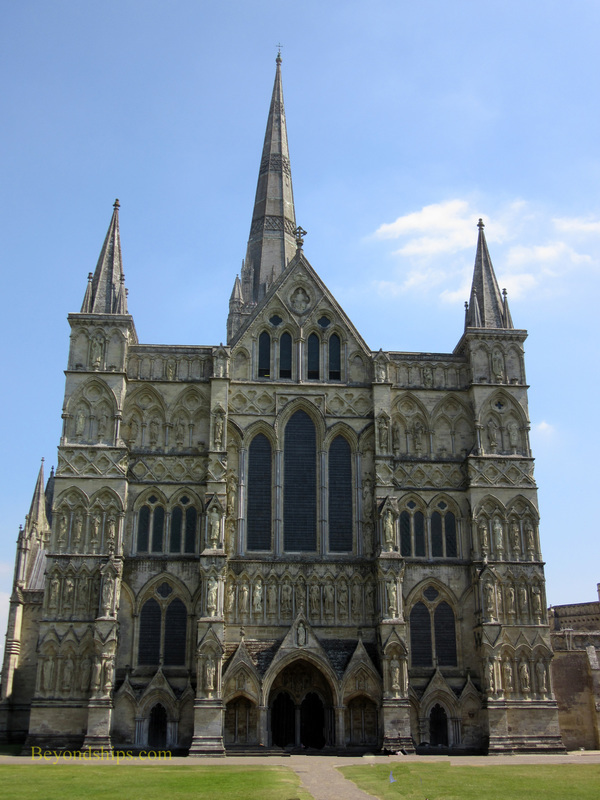 In 1811, Bishop John Fisher invited Constable to visit Salisbury and the artist was impressed by the cathedral and its setting. He also formed a friendship with the bishop's nephew Archdeacon John Fisher. As a result, the artists visited Salisbury a number of times including after the trauma of his wife's death in 1828. In all, Constable did some 300 drawings and paintings of Salisbury Cathedral and its surrounding area. Surrounding the cathedral is the Cathedral Close, some 40 hectares. Immediately adjacent to the building are grassy lawns often enjoyed by locals in fine weather. Further away are a number of mansions, several of which are now open to view or have been converted into museums. Still, further on are the water meadows. For more information and opening times, see the Salisbury Cathedral website. ﻿​On display in the Cathedral is what is believed to be the world's oldest mechanical clock. Originally located in the Cathedral bell tower (demolished in the 18th century), the clock has no face because the hours were tolled by the ringing of the bells. 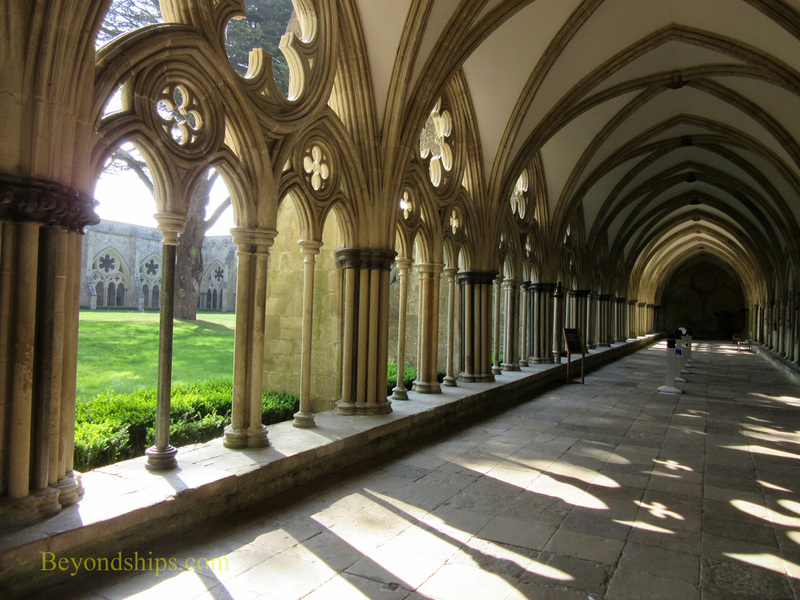 Salisbury has the largest cloister in England. The Cathedral houses one of four original copies of the Magna Carta. The Great Charter was negotiated between King John and his barons in 1215 in hopes of preventing a civil war. Considered one of the great legal documents of all time, the Magna Carta established that the monarch was subject to law and guaranteed important rights such as the right to a fair trial. Elias of Doreham was one of the people who negotiated the charter. After King John gave his ascent to the charter, Elias took on the task of spreading the word and distributing copies of the Magna Carta. He kept one copy for Old Sarum Cathedral. Later, Elias supervised the construction of the new Salisbury Cathedral. Accordingly, the Old Sarum copy was brought to Salisbury. On display in the Chapter House, the Salisbury copy is one of four surviving original copies. It is handwritten in Latin on parchment. The best preserved original, it is kept in a special enclosure to protect it from sunlight.